Delhi Metro Rail Corporation (DMRC) has invited applications from young, dynamic and motivated Indian nationals for recruitment to non-executive posts in DMRC. This success package has been designed for the ones preparing for the written examination for recruitment to the posts of Maintainers (Electrician/Fitter/Electronics/R&AC). The present success kit for DMRC Maintainers Recruitment Examination has been divided into six to seven books namely General Awareness, Logical Ability, Quantitative Aptitude, Electronics Trade, Electrical Trade, Fitter Trade and Refrigeration & Air-conditioning Mechanic Trade. The logical ability section covers both Verbal and Non-Verbal Reasoning, whereas the Electrical, Electronics and Fitter Trade section covers the basics and essentials of electrical engineering, electronics and fitter trade respectively. Each chapter in the book contains ample number of solved problems which have been designed on the latest test pattern and syllabi for the recruitment examination. The solved problems have been presented in a comprehensive manner for in-depth understanding of the concepts on which the questions are based. Also each chapter ends with practice exercises which also have been designed on the syllabi and test pattern. Hints and solutions to the exercises are given after the exercises for effective comprehension of the concepts. The success kit also contains a model test paper for DMRC Maintainers Recruitment Examination along with its solutions. The model test paper will help students practice and self analyze their level of preparation for the upcoming recruitment exam. 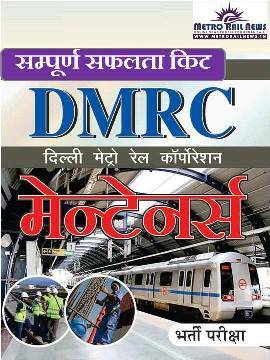 As the book contains ample preparation material as well as model test paper for thorough practice, it for sure will help the aspirants clear the upcoming DMRC Maintainers Recruitment Examination with flying colors.